Dr. Rahul Bhargava is one of the best Hematologist in Gurgaon with an experience of over 2 decades in his field. Dr. Rahul Bhargava is a leading bone marrow transplantation specialist and clinical hematologist. Dr. Rahul Bhargava is known for excellent patient outcomes and this has earned him the reputation of being among the best of his generation in this field of specialization. 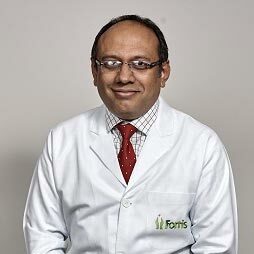 Dr. Rahul Bhargava became the first Indian doctor to do and popularize stem cell transplant in multiple sclerosis. Dr. Rahul Bhargava's vision of the first integrated center of excellence in Hematology, pediatric hematology and stem cell transplant has been full filled at FMRI, Gurgaon. Dr. Rahul Bhargava is the champion of community hematology through which he constantly works on Anemia Free India. Dr. Rahul Bhargava is one of the top Hematologists in Gurgaon and has an experience of more than 20 years in this field. Best Out-Going Postgraduate Resident Award in Gandhi Medical College. Best outgoing student in DM- AIIMS. MBBS- Gandhi Medical College, Bhopal. MD (Medicine)- Christian Medical College, Vellore. DM (Clinical Hematology)- AIIMS, New Delhi. Fellow- Department of Hematology and Stem Cell Transplant, Vancouver General Hospital, British Columbia. World Cancer Day: To defeat it, you need to understand it. Know this, then become a bone marrow donor. Colon Cancer : Things to watch out for?